Vinyl Digital Exclusive: Limited edition of 300 "glow in the dark" copies! 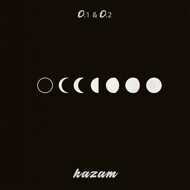 French producer Kazam, is not a newcomer to this game called beats. Every song is a sure shot what he has already proven with his EP "0.1" and numerous singles. Now he comes with the follow up work “0.2” and packs “0.1 & 0.2” as his vinyl debut together! A very special and outstanding work for beat collectors! Kazam - 0.1 & 0.2 - Spotify Playlist - Singles Updated!